Is That Name A Deal Breaker? Ladies! If you met the love of your life and his last name was Sackrider or Ballitch, would it be a marriage deal breaker? Ever since I got married and took on my husband's last name, I can't tell you the hundreds of times the name has been mispronounced, misspelled, and questioned. Our last name is NOT Sackrider or Ballitch! However, the name Oien could prompt you to ask…”how in the world do you pronounce THAT?” Respectively, when you look at it and see all those vowels run together, the brain can't even comprehend how to form a possible pronunciation from this grouping of letters. It's got to be misspelled. You meant the O to be a D or maybe the i should be a w. This happens all the time. I admit when I first met my husband-to-be and he told me his last name was Oien, I said..."huh?" "What is that?" Meaning...what heritage, tribe, pedigree or species do you descend from? Is it even LEGAL to have 3 vowels together? Don't we have spelling RULES? Like I before E except after C.
Is there a rule for too many vowels? 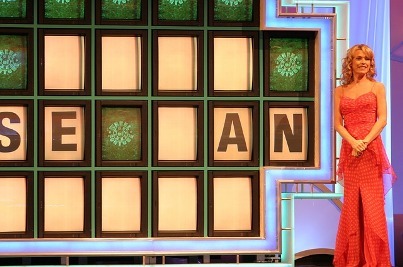 Did this guy buy too many vowels spinning "The Wheel" and now he's stuck with them forever!!! I pondered, will this last name be a deal breaker? By tradition, if I take his last name in marriage, will I even be able to pronounce it myself? Now, granted, we had just met, so why would I possibly jump to conclusions of marriage already. FYI gentlemen, if the relationship is heating up, sometimes "us" gals just might try the last name on for size. See how it rolls off the tongue and write it down a 121 times to see how it looks. In high school, how many scribbles in notebooks had you written your name with the last name of the guy you were fawning over at the time? These days, many women hyphenate their name, keeping their maiden name along with their married name. Sometimes for personal or professional reasons they won't use the husband’s last name at all. I'll clue you in the best possible way I can in written form on how to pronounce Oien. If you replace the "I" with a "Y" it might make more sense. Oy (rhymes with toy) and then en (rhymes with hen) Oy - en. His heritage, tribe, pedigree is Norwegian. Wow, really?!? I wouldn't have guessed that! I thought maybe he was raised by a tribe of Vowels. Not really, but c’mon I didn’t see that coming. Because once he told me the Norwegian thing, I had to rethink my notion of a deal breaker. Coincidentally, my name was Peterson, which is also Scandinavian/Norwegian. This was our first connection. We were basically from the same tribe and the rest is history folks! Frankly, we both knew what Lutefisk and Lefse was! I'm not alone in the name game. You may be one of them. How about those engagement announcements that have some pretty funny and interesting name combos? Like the Gross-Pantti engagement, the Moore-Bacon wedding or the MacDonald-Berger duo . Check out this link for some more hilarious Last Name Fails. Do you have a funny last name? Share your name dilemma. If you like my quirky humor stories, please subscribe to A Square Of Chocolate here and get every post delivered to your email. You can also follow me on Twitter and Instagram. Growing up I loved my dad's best friend's name: harry back. Oh my goodness that's hilarious! You're right...poor guy! Hopefully, he had a good sense of humor! Yes a lot of vowels but at least it is short. When I married my husband I did not take his last name. Spelling, number of letters, repeating was not going to go away or give me an advantage with his so I stuck to mine. A girl's gotta do what a girl's gotta do! Thanks for sharing Haralee! When I was growing up we have a kid in school named Tim Buhr. Which I always thought was kind of amusing. But just a few days ago I was watching an episode of Beach Front Bargain Hunt on HGTV and these people were looking to buy a place on the coast of New Jersey. They had a bit about their favorite vineyard where they liked to go and do some wine tasting...the name of it was Turdo! I had to LOL about that one! Lol - It took me a moment with Tim's name, but I get it. Timmm - Berrr...he must have had people yelling Timber a lot in the school hallways. Vineyard named Turdo? Not good! I was just the opposite after having the maiden name of Haskett and it being mispronounced my whole life I was thrilled to switch to McDaniel (You have to many vowels and we got the consonants). When my daughter got married her name became Utter. She really wanted to name her son Kyle, but I talk her into Caleb instead. She shortens it to Cal Utter. The poor kid! I get it. My maiden name was more than difficult. I was grateful the day I got my new drivers license with my married name on it. Book Coming Next Spring - Over The Moon Excited!